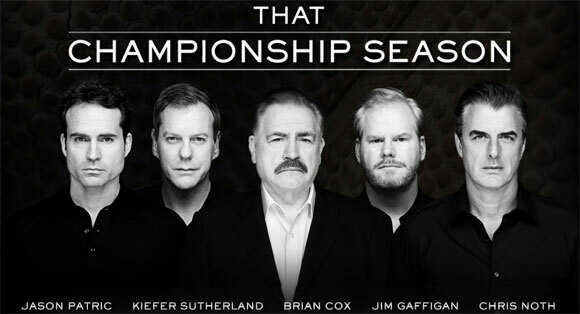 Home » Film & Theater Clips » Watch 8 Minutes of ‘That Championship Season’ plus cast interviews! Watch 8 Minutes of ‘That Championship Season’ plus cast interviews! Want to watch 8 minutes of That Championship Season? Thanks to Broadway World, you can! The video features all the stars (Brian Cox, Jim Gaffigan, Chris Noth, Jason Patric and Kiefer Sutherland) in snippets from the show. Also check out the brief cast interviews. I recommend the one with Brian Cox if you can only watch one. This is a limited engagement through Sunday, May 29th, 2011. What’s your favorite moment in the play? What’s it like to act in your fathers play? What’s the best way to play comedy? What is it like working with this cast? Did you always want to be on Broadway?